Our cottage is part of a working farm situated in a quiet attractive setting, nestling at the foot of the stunning Ochil Hills on the A91 between Menstrie and Alva in the county of Clackmannanshire, Scotland. They are tastefully furnished and fully equipped with all utensils and appliances that may be required. 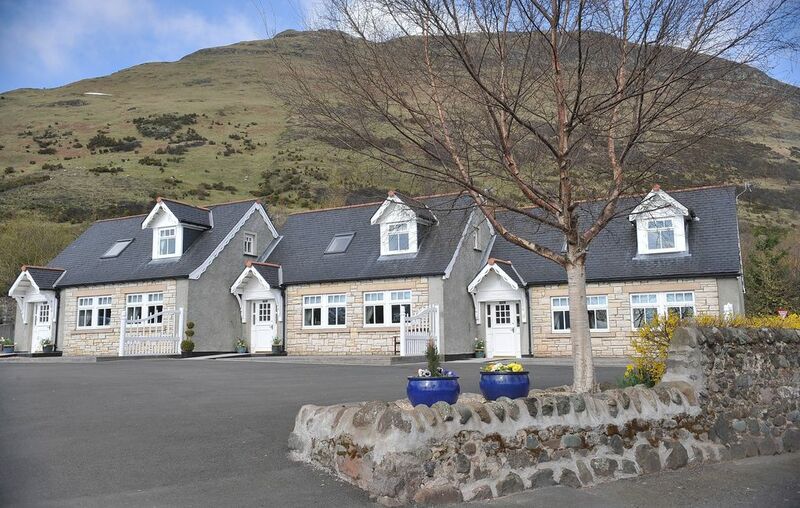 Staying at Balquharn Holiday Cottages, Alva, in the heart of Central Scotland with a host of leisure activities for your family or friends nearby including Fishing, Golfing, Blair Drummond Safari Park, Tower Trail, Glen Walks, Sterling Mills, Wallace Monument, Stirling Castle, The Kelpies and Helix Park. Hill walking and cycling is available right on the doorstep. (Storage for bicyles is also available). Those who prefer a more laid back break can relax and enjoy the peaceful countryside surroundings. With a short drive you will be able to reach Stirling and the Fife Coast. A short 8 mile drive will give you access to Glasgow, Edinburgh and Perth motorways. Stirling Railway Station is 7.1 miles. Alloa Railway Station is 4.1 miles. Balquharn Holiday Cottages are an ideal central base location if you wish to tour Scotland. My name is Laura and I run the holiday cottages on the family farm. I live on the farm with my husband, two children and my parents live next door. We are an arable farm but also have a herd of Highland cows and three pet sheep who live in the field in front of the holiday cottages. The family bought the farm in 1983 and its where I was brought up. I am lucky enough to raise my own family on the farm too. Lots of open spaces and fresh air - perfect for families with children. There is also a washing line outside. Two car parking spaces available in front of cottage. Tea, Coffee, Milk and Shortbread provided for arrival. Dining table with four chairs and two extra stools if required. Large garden area with a tree house, sand pit and swing for children. The cottage has a wheelchair ramp at the front door and all facilities required on ground level. We reserved Willow Cottage at the last minute for two nights. Since it was short notice I didn’t have much time to search. When we arrived I was pleasantly surprised at our good fortune! We traveled the UK for three weeks. Willow was by far the most comfortable. Laura does a great job! I am so pleased that you all enjoyed you stay with us and to say it came out on top out of all your accommodation in Scotland is fantastic. Thank you so much! The cottage was clean and comfortable with all the amenities we needed. My kids loved seeing the highland cows and sheep. The location is also great. Just a short drive to the Wallace Monument and Stirling Castle. However, there are only beds for 5 people. There are 3 single beds upstair and a double bed downstairs. A 6th person would have to sleep on the couch. As we were only 5 people, it wasn't an issue. Communication with Laura was easy and she was extremely helpful and friendly during our stay. I highly recommend staying at the cottage during a visit to Stirling. Derrick, thank you very much for you kind comments and I am glad that you were very happy with the cottage and service provided. With regards to a sixth person staying in the cottage - if it is requested when booking that it will be six people staying in the cottage a camp bed with linen and extra towels are all provided and in the cottage before check in. No one has to sleep on a couch. Gorgeous and quaint cottage in a beautiful setting! Laura was a wonderful host. Her cottage is immaculate, beautiful and fully stocked with all the amenities you could want or need. Our children absolutely loved being able to walk to see the sheep and highland cows. If you are looking to stay in the highlands or near Stirling Castle, I highly recommend this beautiful cottage! Thank you for your lovely comment. Its nice to hear that the hard work and effort we put in to maintain a high standard shines through. Our fantastic three weeks in Scotland are partly attributable to the excellent accommodation we had in the Balquharn Country Cottage. Nestled between the villages of Alva and Mentstrie makes it a great location for seeing many of the sites of Scotland. We enjoyed morning walks to the two villages and day trips to many places. The highland cattle, lambs and sheep in the paddock in front of the cottage create an idyllic rural setting. Laura was very helpful ensuring our stay was pleasurable and that we were well informed as to places to visit. As a family we enjoyed the well equipped and clean cottages that we very tastefully decorated. It is a place that we would recommend to others and would love to come and stay there again in the future. The cottage is one of the best where we have ever stayed. Wonderful. We have found everything we needed except maybe a coffee machine, for french people, but sincerely, it was so nice that we didn't even miss it. Thank you very much Laura.